Children love relaxation... it just might take them a few times to realize it. Once they experience its sweetness and joy, they will never let you leave the class without it. Being covered can really help to relax, as the extra weight and sensation all over our body is extremely settling. So sometimes at the end of the class, just for relaxation, we lie under the mat instead of on top of it; the children really enjoy being tucked in for the final relaxation. Real blankets are even better to use, if you have them around, because there is a slight challenge with lifting the mat off the floor; once the children realize this is possible, it will be harder to keep the mats down during the class. Eye pillows help us to close the eyes end to calm down and become quiet. We use our eyes a lot to relate to the world; when they are gently shut in this way, it helps us to disconnect. You can buy eye pillows or make your own using socks that you can fill up with rice and then tie closed. You can scent the eye pillows by adding dried lavender or herbal tea to the filling, or even by spraying aromatic oils on them. Scents can be very helpful in creating a relaxed state of mind. I use a Tibetan bowl in almost every class and for all age groups. You can get a Tibetan bowl at the closest Tibetan store or online. They are a bit costly, but they are worth it. These bowls are a magical tool for focusing, relaxing and healing. Their sound vibration brings the mind to a total state of calm (alpha brain waves) in seconds. The children love them and look forward to it. To use the bowl, place it on the student’s heart/chest, belly, or back (if they are lying facing down) and strike the side of the bowl gently with the softer or wider part of your playing stick. You can use the bowl at the end of the guided imagery or combine the sound as a part of the journey. The Tibetan bowl can be the song of a magical bird, the sound of the wind, or the call of whales. You can also use the Tibetan bowl as a relaxation by itself. I do this when the class is a bit wild, and I also say that my magic bowl will visit only those who lay down quietly with their eyes closed, which usually has the desired effect! Children feel the vibration of the sound all over their body, so even very young children will stay still, waiting for the magic bowl to visit them. Put a small stone (I use glass pebbles or crystals) on the foreheads of the children when they lie down with their eyes closed. I tell the them that with this special yoga diamond, they can talk to animals and understand animal language, that they can see the past or the future, that they’ll be able to read thoughts, or that the yoga diamond will give them the ability to fly... it depends on the theme. I also tell them that the magic of the yoga diamond will work only as long as it’s on their forehead; if the diamond falls, the magic breaks. This makes them lie down motionless and helps them to focus on the relaxation. You can give the children the yoga diamond as a gift at the end of the class; a gift they can use in just the same way every time they feel they need to relax. You can even ask them to bring their yoga diamond back to every class to be used at the relaxation. It’s great to do this pose for final relaxation if you have been on a picnic (then it can be a burrito) or if you are in Egypt (then it’s a mummy). It all depends on the theme of your class! Lie down on your yoga mat sideways and close to the edge. Hold onto the edge of the mat with one hand, keeping the other arm beside your body. Roll toward the long part of the mat and let yourself be wrapped by it. Close your eyes and rest. I love this technique because the children cannot move while they are rolled up! The pressure of the yoga mat does help to relax though, and at the end of the relaxation you can roll the children out of their sushi by pulling on the open end of the mat. 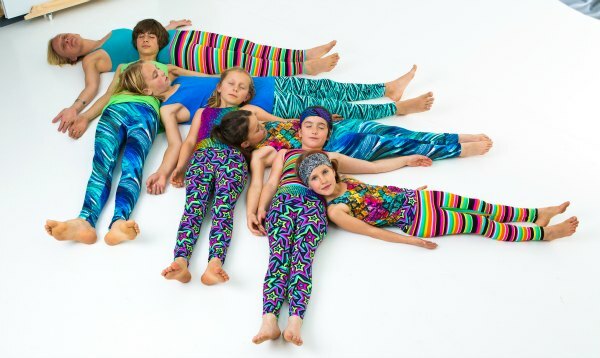 Young children will need help in order to roll into this pose, and some, who may feel claustrophobic, will handle it better if their arms stay out of the mat; they just need to start the pose with their arms raised over their heads. You can count ten deep breaths before the relaxation, as it is sure to help quiet your class down. If the children are fidgety at the end of guided imagery, use counting to make them stay there for a few more breaths; they can each count silently to themselves for ten or twenty breaths, before they get up. Young children might have a hard time remaining in total silence, so you can say “I will count to 10… only when I reach 10, you can stretch your arms over your head, make yourself longer, take a deep breath, yawn, and slowly sit up… 1… 2…”. Everyone lies on the floor completely still. If someone moves, they have to step over to the side. In this game we invite the action of stillness rather than saying “don’t move,” which makes it more fun and more effective! In this exercise we all (except the first person on the escalator) lie with our head on the belly of the friend before us. We breathe deeply and feel how we lift and lower our friend’s head with our belly as we breathe, and how the same is happening to our head on the belly of the friend before us. We close our eyes and listen and feel the breath moving like waves, helping us go deeper into the relaxation. The interdependence in this exercise and the responsibility you have for your friends to stay in the pose helps the children to stay still for a long time. Reflexology and other kinds of massage are great ways to relax. You don’t need to know reflexology (although it is great if you do) to massage the children's feet; just follow your heart and your hands and make it pleasant. If you massage them too lightly, it will tickle, so use firm yet gentle touch. Use foot or hand creams that smell good, like strawberry or banana. Try to combine the massage with your class theme or with the journey you take in your guided imagery. For example if you are in the sea, the massage can be dolphins who lick your feet, or if you are in the sky it can be the clouds who will massage your feet. If you teach in a kindergarten or in preschool, let the children massage their teacher -- it will melt the teacher’s heart! In family yoga it’s even better; let the parents massage the children and then the children massage the parents. Did you ever get a massage from a child? All the annoying things they ever did will be erased! Sometimes it is nice to finish with a short and inspiring story either after the relaxation or instead of it. It’s a nice way to end the class either with a message or with something funny. How do you help children stay longer in relaxation? Share your tips with us below!